Who would guess that a time-turning fantasy twist could be braided into a grim and edgy mystery, ending up with one of the most complex, suspenseful, and original page turners of the season? That’s what Stuart Turton’s debut crime fiction achieves. Here’s the premise: Sebastian Bell—at least, that’s what people tell him he’s called, although he can’t recall a thing about his life before waking up injured in a dark woods—witnesses a murder. Or does he? No, it turns out he might not really be Sebastian, and the person he’s sure he’s there to protect, Anna, isn’t known to anyone at the mysterious house party where he’s a down-at-heels guest in a tumbledown mansion without phone service. Then, just as things are starting to make sense, Sebastian’s in the middle of a much more pertinent possible murder plot. One that he’s supposed to stop, if he wants to save Anna. But who is Anna, anyway? That’s meant to be confusing. 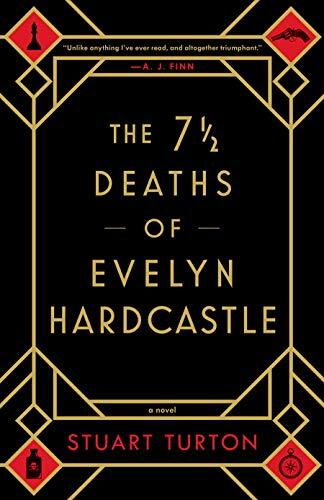 The protagonist of The 7½ Deaths of Evelyn Hardcastle won’t figure out exactly who he is until there have been several more swift changes of point of view. And why he’s there is an even tougher mystery to unravel. “I’m out of my chair before the draft fades, pulling open the drawers of my nightstand, searching for some mention of Anna among my possessions, anything to prove that she isn’t the product of a lurching mind. Unfortunately, the bedroom is proving remarkably tight-lipped. Aside from a pocketbook containing a few pounds, the only other personal item I come across is a gold-embossed invitation, a guest list on the front and a message on the back, written in an elegant hand. From the invitation, Sebastian realizes he’s a doctor, but in his current state of chaos, he doubts he could even wield a stethoscope correctly. Terror escalates. The protagonist’s genuine efforts to be heroic and intelligent, despite the situation’s brain-damaged outlook, bind him rapidly to several of his fellow guests. Whether he can actually either prevent or successfully solve Evelyn’s murder will determine not only his own fate, but that of others trapped in Blackheath with him. At one moment a desperate Sherlock Holmes, at another a tormented Dante facing a hell he’d never dreamed existed, the narrator insists on enduring each new peril, desperate to solve the case. This urgency turns The 7½ Deaths of Evelyn Hardcastle into a dark and intriguing thriller, a crime novel well outside the norm, and entirely memorable for both plot twists and unusual characters. Place on the stack of “to be read twice.” Turton’s crafted a winner.